I’ve ordered a Win2 Energy Bar with 500 mg of chia (a super food) from Win2 sports nutrition, just to test and compare it with the PowerBar Ride Energy Peanut Caramel bars that I have been using the last couple of years. Win2 Sports Nutrition is a relative new Belgian brand of (cycling) sports nutrition, which collaborates with not only professional athletes but also a Nutritionist from the Academic Hospital in Gent. The Win2 Energy Bar attracted my attention because chia seeds, a well known super food, are used in this energy bar. In addition the Win2 Energy Bar is glutenfree and doesn’t melt. The Win2 Energy Bar weighs 40 grams and is made out of 40% pure almond-pulp and available in the tastes banana, strawberry and almond. There is even a Natrium Plus version of the Win2 Energy Bar available from the Win2 online shop. The PowerBar Ride Energy bar weighs 55 grams, while the Win2 Energy Bar comes at a weight of 40 grams. Both packaging wraps luckily have tables of per 100 gram values, so I can compare both energy bars a little better. The PowerBar Ride Energy bar has a higher concentration of magnesium, proteins and salt compared to the Win2 Energy Bars. The Win2 Energy bar has a total energy of 1955 kJ per 100 grams, while the PowerBar Ride energy has 1706 kJ per 100 grams. I’m not sure if you will directly notice these differences on you road bike. Finally let’s compare the price-point of both energy bars. 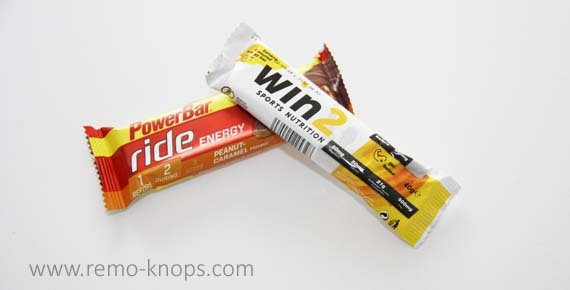 A Win2 Energy Bar comes at price-point of € 1,49 which is slightly more expensive than the PowerBar Ride Energy bars. The latter cost me about € 1,10 per bar, when you buy them in bulk. The Win2 Energy bar banana flavor tastes well and is easy to consume. You can see the Chia seeds in energy bar, and there is no chocolate wrapping around the bar, so your hands will stay clean and tidy. 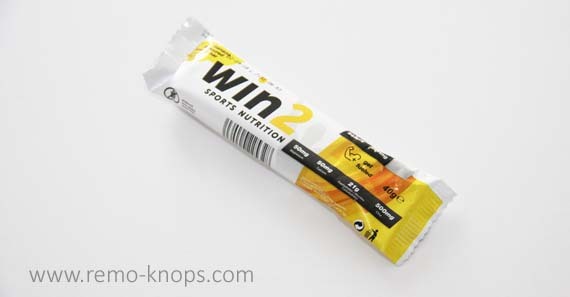 If you have a gluten intolerance, these gluten free energy bars from Win2 Sports Nutrition are certainly worth trying. I think it is good that there is some extra competition for the big brands in the sports nutrition market. I’m curious to learn what you favorite energy bar is ? Interested in other reviews of cycling products? Hey!, I found this information for you: "Win2 Energy Bar – Sports Nutrition with Chia Super food". Here is the website link: https://www.remo-knops.com/6851/win2-energy-bar-sports-nutrition-chia-super-food/. Thank you.